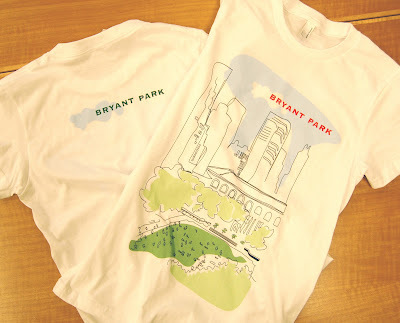 They're flying off the virtual shelves at the Bryant Park Shop, so now's the time to pick up your official park t-shirt. We have three designs to choose from, including the Bryant Park Illustration tee pictured above. All shirts come in Men's/Unisex and Women's sizes ranging from small to extra large and are made from super soft jersey cotton. The Illustration t-shirts come with a funny coincidence: Jamie Song, our Graphic Designer, drafted the aerial drawing a few years ago, when we first discussed creating t-shirts as a memento for park visitors and fans. It was pure coincidence that after Bryant Park Corporation's move to 1065 Avenue of the Americas in early 2010, the perspective Jamie chose for her drawing became the view we see everyday from our windows on the 24th floor. Check out the selection and order your t-shirt online at shop.bryantpark.org. Thanks for stopping by my blog and explaining why the fountain was on in the middle of winter! That is really cool. I work in Midtown West so I pass by or through the park a lot--I'll keep an eye on the blog now so I have a better understanding of all the events going on there!